We’re proud to announce the return of Onboard, back by popular demand! 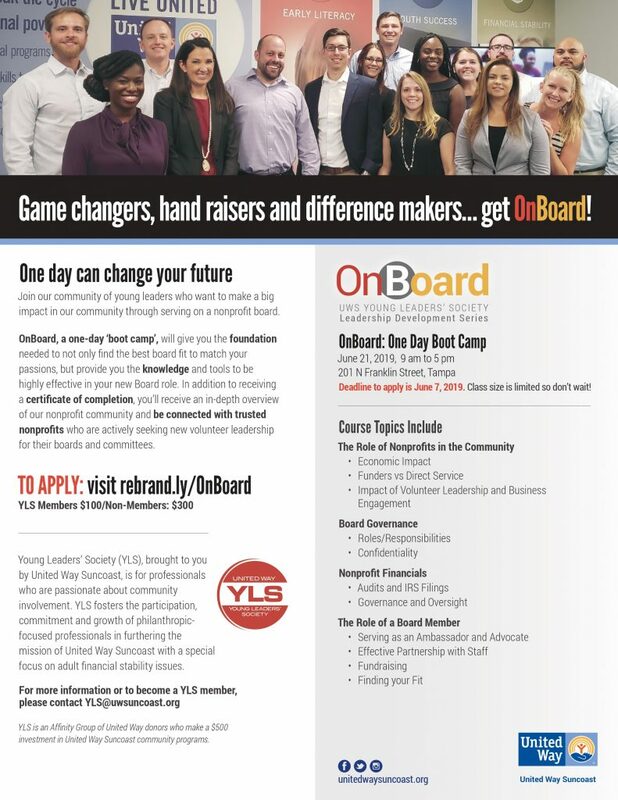 Join a community of young leaders who want to make an impact in our community through serving on a nonprofit board. This course will give you the foundation needed to not only find the best board fit to match your personal passions, but provide you with the knowledge and tools to be highly effective in your new board role. In addition to receiving a certificate of completion from United Way Suncoast, you’ll receive an in-depth overview of our local nonprofit community AND be connected with trusted nonprofits who are actively seeking new volunteer leadership for their boards and committees. You’ll also be connected with past OnBoard alumni to continue building community connections. CLICK HERE to apply. Be sure to share the flyer below with your friends, family and coworkers. *YLS Members invest $500 or more annually in United Way Suncoast programs to fund education and financial stability initiatives to ensure every person in our community has the opportunity to achieve their full potential.